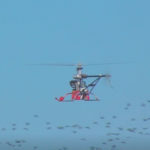 New unmanned helicopter for the supply of heavy loads of cargo to battlefields, being able to lift up to 180Kg with a top speed of 150Km/h. Israel Aerospace Industries (IAI) has developed an unmanned vehicle for the Ministry’s Weapons Development Administration, in collaboration with foreign and domestic companies. The project goal is the development of a small UAV or drone able to fly autonomously a distance of at least 8Km with a carrying capacity of 150 litres with a minimum weight of 60Kg, as specified by the Ministry. The drone mission consists of carrying a package to a determined location in the battlefield, drop the cargo (landing or not) and return to base as fast as possible while flying totally autonomously. 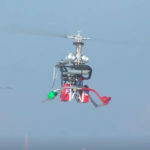 For this purpose, a helicopter design with one main rotor to lift and a second rotor to steer has been chosen. 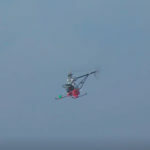 The IAI drone is based on a heavy lifting helicopter constructed in a lightweight structure with a non-covered chassis, reducing the aircraft weight up to the limits of technology. This heavy lifting UAV is able to fly lifting 180 kilograms with a top speed of 150 kilometres per hour, being a unique system in its category. The control of the heavy lifting drone is performed fully autonomously with the installation of a high performance autopilot system, which adds to the system the intelligence needed to perform this kind of autonomous missions. IAI has been working closely with collaborators to intensively test the heavy lifting system under the most strict safety criteria, ensuring in all moment the reliability of the system and focusing it to the full success of every mission performed. 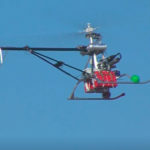 This innovative drone is able to transport a great variety of loads and cargo for Special Forces in the precise moment, such as a team of soldiers carrying out a covert mission while lying in ambush of enemy forces. The heavy load transported may include, for instance, weapons, ammunition, observation devices, batteries or food and water, being it safer than using traditional manned ground vehicles which run the risk of hitting explosives.